Club Penguin Cheats by Mimo777 Club Penguin Cheats by Mimo777: Mimo's Secret Hiding Spot Revealed! Well here it is! In Club Penguin THIS is where I like to hide, hang out and watch! If you don't know what I'm taking about, click here. So how did the vote go? Were you correct? Q. Hey Mimo, does that mean we aren't having a party? A. NAH, LET'S PARTY ANYWAY! WOOT! I'll let you know when and where my Secret Hidden Spot Party will be VERY soon! So watch carefully! aw, I really thought it was option 2! Well I guess I was wrong! oooooh i was wrong this stinks but it was fun trying to figure out where u liked to be??? right? I VOTED FOR THE FIRST ONE AND I AM CORRECTTTT!!! Oh YEAH! I knew it! I told you =] Sorry I like being right lolz. Mimo always parties at the Mine dudes. When ever he parties its at the Mine. We were so off! But I'm ready to PARTY! Aha! I knew it! But of course everyone voated for Spot #2,but it's less obvious that it's Spot #1,that's why I picked it ;-) Well Party,Woot! Yay Mimo. Personally, I kinda knew that the Mine was your hiding spot. I was right AGAIN. HA HA PARENTS. IM NOT DUMB! Sorry for that moment. Ta ta for now! I agree! It's going to ROCK! finally, I've been waiting for mimo to post something for like two days. Congrats to my friend Toysgoneby to being on the mod list! Congrats also goes to my friends Lemon2608 and Policeman655 for being almost mods! Awesome! I was right I voted for #1 Since you can hide there without your name being seen. I KNEW IT! WOOT WOOT LETS PARTAY! If my brother had a blog it would be pretty gross. Woot! Knew it! Im glad your still having a party! I wonder when... Im sure it will be soon. Oh by the way, I have a count down on my computer for when Herbert's revenge comes out. right now forty nine more days! Unless it comes out early like next month like they said. But for now forty nine more days. Same here. It took me a while but I knew that was the best answer! Oh Yeah I got it correct!! yeah that was awesome! go mimo! Yea! congratz to all the new mod changes and soon to be mods! Aww! I knew it wasn't number 2 but I thought it was number 3! PS:SO SORRY I haven't been modding, I've been super busy. SORRY SORRY SORRY. Oops! Sorry about the caps! Oh ya! I remember his aqua party or whatever and he had it at the soccer pitch AND the mine! Yeah i got it!!! 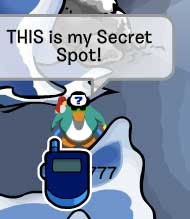 I figured it would be there because it blocks out his name and it would be hard to click on his penguin to check if it really WAS mimo without clicking on the spy phone instead. Because i didn't know about the mine, i used logic instead. and i still got it! YAY! I got it! I mean its not a good hiding spot at the light house because they would see you name but its hard to see it through the rock and spy phone... I'm just happy I got it. I think the problem is that to many people would have said something else but they saw there were more votes for lighthouse so they voted that too. I wasnt wrong! I voted for number one because I thought that two made your name WAY to visible so thats not secret. Also number three is kind of out in the open because lots of people look and go up there, unlike number one. I was right but I was wrong!! I voted for both of those spots. LOL!!!! Well, I was half right anyways!! P.S. Go to "The Owl Box" on Ustream and watch a live video feed of Molly the Owl and her babies!!! It's soooooo cool!!! *Just a reminder of the Mimo CPG Rules*- "don't be rude, mean or negative. seriously." What you said really isn't all that offensive, but Queen Binawa just said congrats, so there's nothing harmful in that. ;) Hope that I wasn't too harsh! I wonder what time the party will be. I know Eran. It's been like FOREVER since Mimo last posted something. I've been so bored an have been constantly looking to see if he's posted anything new yet. Nothing really happening in CP either. I wonder.......? P.S. Plz visit my profile! I have a funny audio clip you can watch. Thx so much! 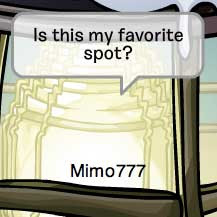 Mimo, I found a big boo boo in the club penguin times! on the secret revealed page (b8) when you click on the classified part the page is about the jet pack but it says ''many know that the hardest thing to do is run the coarse WITHOUT getting and coins... but not many know about the secret prize. make it to the end WITHOUT GETTING A SINGLE COIN and you will get 1000 coins''....did you see it they kinda said the same thing twice! its my b-day in 3 days please give me credit! aww man i thought it was that one!!! I voted number 1 WOO!!! Can't wait to go to your party. I got it right. it was easy. cant wait for party. OMG I so thought it was going to be number 2...oh well we still partay!!! 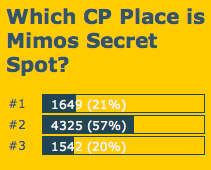 I think most people voted for #2 cuz it is like a hiding place. After most people voted for that, people kept on voting cuz they thought if all them voted for that, I might be right too, and they voted. But I thought logicaly, and I voted for Mine cuz you often make screenshots of you in the mine (Well, in my opinion, you do). I picked option 2 also, next time we can all try again! A VERY HEPPY HAPPY BDAY LIZZY! hmm why dont we have a party on cp for his bday? YAAAAYYYY! I KNEW IT! Thats my favourite hiding spot too(the best one,the others arent even hiding spots!!!! aw, I really thought it was option2! Well I guess I was wrong! I thought it was # 2 too! but I guess most people voted for # 2! Yea! Congrats me, Toys, and Police! I would feel the same if my name got changed to Lemon26o8, and he didn't change it. But it doesn't matter as much, as long as you are up there. Talk about ice cream, try getting a few thousand dollar computer for your SEVENTH birthday! thats a lot of $. But it was an old one, but it still works great! But other than that parents are just a flaw in every kid's life. They are a gift, and a curse. mimo! i know this is off topic but WHY doesn't club penguin have bed furniture? or birthday parties? or one more thing... CANDY? There haven't been any new mod changes yet. It doesn't really get confusing. Also please don't write in caps I mean my ears just popped! Hmmmm...Nope I don't see any problem with that! Please just put CPG MOD when you are modding. Thanks! I am new to the website and I like the idea of the party.when is the party going to be happening? Hi I don't realy know why they are going to be having a party ? im happy theres still a partyy!! no offence but when u said him were u talking about mimo cause im a girl?? LOL! Yea lets party anyways!! I knew it was opetion 1! That was the one I voted for. I got so mad when I saw everyone was voting for Option 2. I was like "PEOPLE! It's Option 1! If you don't vote for 1, we're not having a party!" Glad to see you're still having the party. I hope I can make it. Waddle On! GAAAHHHH !! I WAS WRONG !!! 1st one? :( cause i got it wrong but :D and :) for the party! Hahahaah I got it right!! i was right! i got so mad when 2 was winning cause i totally knew it was 1 ! !